Scientists at the Salk Institute for Biological Studies have developed an improved technique for generating large numbers of blood cells from a patient's own cells. The new technique will be immediately useful in further stem cell studies, and when perfected, could be used in stem cell therapies for a wide variety of conditions including cancers and immune ailments. "There are further improvements that we need to make, but this takes us a significant step closer to the ultimate goal, which is to be able to take ordinary cells from a patient, induce them to become stem cells, and then use those stem cells to rebuild lost or diseased tissues, for example the patient's bone marrow," says Inder M. Verma, PhD, Irwin and Joan Jacobs Chair in Exemplary Life Science and American Cancer Society Professor of Molecular Biology at the Salk Institute Laboratory of Genetics. Verma is senior author of the report, which is published in the July edition of the journal Stem Cells. Stem cell researchers have been racing towards this goal since 2006, when techniques for turning ordinary skin cells into induced pluripotential stem cells (iPSCs) were first reported. In principle, iPSCs mimic the embryonic stem cells (ESCs) from which organisms develop. Researchers now want to find the precise mixes and sequences of chemical compounds needed to coax iPSCs to mature into the tissue-specific stem cells of their choice. The latter are self-renewing, and can be transplanted into the body to produce the 'progenitor' cells that multiply locally and produce mature tissue cells. However, researchers don't know yet how to induce iPSCs to become tissue-specific stem cells or mature tissue cells with high efficiency. "We've been producing these cells in quantities that are too low to enable them to be studied easily, much less used for therapies," says Aaron Parker, PhD, a former graduate student and now a postdoctoral researcher in Verma's lab. Parker is a co-lead-author of the paper, with Niels-Bjarne Woods, PhD, who was a postdoctoral researcher in the Verma lab at the outset of the project, and is now an assistant professor at Lund University in Sweden. Like many other stem cell research laboratories, the Verma lab has been trying to find more efficient ways to turn iPSCs into blood-forming 'hematopoietic' stem cells (HSCs). These may be more valuable medically than any other tissue-specific stem cell, because they can supply not only oxygen-carrying red blood cells but also all the white blood cells of the immune system. "There would be an almost unlimited number of usages for true HSCs," says Verma. For the present study, the research team sought to do a better job of mimicking the changing conditions that naturally direct ESCs to become HSCs in the womb. "We took seven lines of human ESCs and iPSCs, and experimented with different combinations and sequences of growth factors and other chemical compounds that are known to be present as ESCs move to the HSC state in a developing human," says Parker. Applying cocktails of these factors, Parker and Woods and their colleagues induced the iPSCs and ESCs to form colonies of cells that bore the distinctive molecular markers of blood cells. With their best such cocktail they were able to detect blood-specific markers on 84% of their cells after three weeks. "That's a big jump in efficiency from what we saw in the field just a few years ago," says Parker. The technique still has room for improvement. The researchers detected progenitor cells and mature cells from only one category or lineage: myeloid cells, which include red blood cells and primitive immune cells such as macrophages. "We didn't see any cells from the lymphoid lineage, meaning T-cells and B-cells," Parker says. 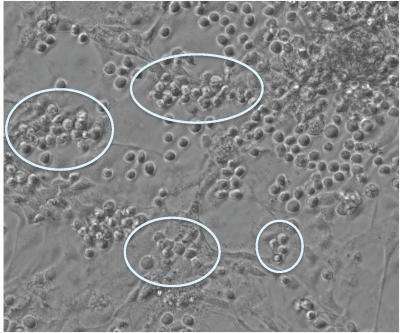 From this and other labs' results, the team hypothesized the existence of an intermediate, pre-hematopoietic type of stem cell, produced by ESCs and iPSCs and in turn producing HSCs. "We know that HSCs appear in a particular region of mammals during embryonic development, and our idea is that these pre-hematopoietic stem cells are there and are somehow made to mature into HSCs," says Parker. "So our lab is now going to focus on finding the precise maturation signals provided by that embryonic region to produce these true, transplantable HSCs." Once that is done, researchers will need to make a number of further refinements to improve the safety of HSCs intended for human patients. "But we're now tantalizingly close to our ultimate goal," says Verma.